Alexievich, Svetlana "Second Hand Time. The Last of the Sovjets"
After my Christmas digression into light Irish literature, I return to my usual set of deep and thought-provoking reads already with this week’s review. More precisely I picked a Nobel read for My WINTER Books Special, the only one that I could find, namely The Winter of Our Discontent by John Steinbeck. The members of the committee of the Swedish Academy mentioned especially this last novel of the American author when they awarded the Nobel Prize in Literature to him in 1962. It’s the story of a good and honest man who finds his morals corrupted by the requirements and habits of post-war America where virtually everything seems permitted to achieve financial wealth and social status. John Steinbeck was born in Salinas, California, USA, in February 1902. He grew up in the rural atmosphere of his birth town at the sea surrounded by many migrants, an environment that later often appeared in his literary work. After high school he studied English Literature at Stanford University until 1925, but his mind was already set on becoming a great American writer and he never earned a degree. In 1929 he brought out his first novel titled Cup of Gold, but success didn’t come before Tortilla Flat was published in 1935. The California novels followed, among them In Dubious Battle (1936), Of Mice and Men (1937) and The Grapes of Wrath (1939). Others of his most notable novels are Cannery Row (1945), The Pearl (1947), East of Eden (1952), and The Winter of Our Discontent (1961). He also wrote the script to Elia Kazan’s famous film Viva Zapata! (1952). In 1962 the author was awarded the Nobel Prize in Literature. John Steinbeck died in New York City, New York, USA, in December 1968. Ethan Allen Hawley is a descendant both of the Pilgrim Fathers and of whalers, maybe even pirates, and thinks of his life as The Winter of Our Discontent. For generations his family belonged to the honourable and rich of fictitious New Baytown on Long Island, but when the whaling industry went down, also their decline began. Upon Ethan’s return from World War II, his father was dead and all that was left of the former wealth were the old Hawley house and the town’s grocery shop. Harvard-bred only in letters and trained for war, not business, Ethan soon was forced not just to sell the shop, but also to stay on as the clerk of the new owner, an Italian immigrant called Alfio Marullo. In April 1960 Ethan still works as grocery clerk keeping the shop that he once owned. He hates his job that barely suffices to cover the expenses of his family consisting of his wife Mary, fourteen-year-old son Allen and thirteen-year-old daughter Ellen. On Good Friday morning on his way to work he meets the bank teller Joey Morphy who shares with Ethan his thoughts about how to rob a bank without getting caught. Later Mr. Baker, president of the bank, drops in on Ethan to convince him to invest his wife’s six-thousand dollars and to restore his family to wealth, power and prestige, but Ethan refuses because it’s Mary’s money and security. Coming by to check on the shop, Marullo points out to Ethan that a good businessman needs always to “look out for number one”, ie for money because it is at the heart of success and nothing else matters. As an honest man to the backbone Ethan won’t listen to him, though. So when a travelling salesman, previously announced by Mary’s attractive and men-hunting friend Margie Young-Hunt, offers him money behind Marullo’s back in return for placing orders with his company, Ethan refuses because he won’t betray his boss. Probably none of this would trouble Ethan, if the same day his wife and his teenage children didn’t make it clear to him that they too crave for money and the prestige it implies. Since he wants the best for them, he begins to question his attitude and convinces himself that it’ll do no harm to put aside his moral scruples at least temporarily – like he did as a soldier. He acts accordingly and the expected results materialise on Independence Day weekend 1960, but Ethan is full of remorse. The Winter of Our Discontent is the author’s lament over moral decline in post-war America which manifested in a huge number of scandals making the headlines at the time of its writing and before. Through his choice of title John Steinbeck also alluded to Richard III by William Shakespeare of which Ethan quotes the respective passage at the end of part one. In the novel’s world – like in the world in which we are living today – money isn’t just the driving force of economy and personal progress, but its cult is at least on an equal level with religion. Baker’s bank house is described as a “red brick basilica” and in one scene the bank teller compares the opening of the safe in the morning with a lodge meeting of the freemasons where “Father Baker genuflects and opens the safe and we all bow down to the Great God Currency.” Nobody except Ethan seems to see any harm in bribery, chicanery and treachery. The novel centres on his inner conflicts confronted with the need to give up his high moral standards for the sake of his family’s happiness. Consequently, most of the story is told from Ethan’s point of view, thus in first person, and only the introducing two chapters of each of the two parts are third-person narrative. The Swedish Academy praised John Steinbeck “for his realistic and imaginative writings, combining as they do sympathetic humour and keen social perception”. All of it can be found in this last novel of his, too, and in addition I noticed a bitter undertone of the kind that seems to be characteristic of advancing age. Already some time ago I realised that every parent or grandparent generation laments over moral decline – in fact I catch myself at it occasionally. 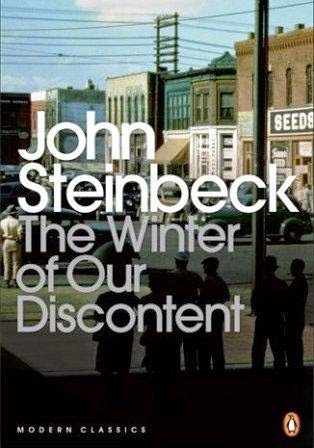 All in all, The Winter of Our Discontent by John Steinbeck has been an absorbing and worthwhile read although in my opinion it doesn’t stand comparison with Of Mice and Men and The Pearl, the author’s other two works that I could finish so far. Considering today's economic situation and the often reckless behaviour of businessmen, the novel has lost none of its importance. Copyright for reviews belong to individual contributors. Powered by Blogger.